Sperian Protection, now part of Honeywell introduces the new Titmus VSeries vision screeners to their range of vision screening instruments designed for accurate and reliable vision screening at work. Incorporating the best features of the Titmus iSeries and Model 2, the new Titmus VSeries vision screeners are ergonomically-designed, precision-built stereoscopic instruments, providing precise and prompt measurement of visual performance. Engineered for accuracy, validity and reliability with an emphasis on convenience and ease of administration, the new Titmus VSeries range includes the Titmus V2 vision screener and the Titmus V4 vision screener. The Titmus VSeries vision screens can be used by testers to screen for visual acuity, muscle balance (horizontal and vertical phoria), depth perception, colour perception and binocular vision. Titmus V4 also offers night vision testing for individuals who need to have their vision screened in night-driving conditions. The Titmus VSeries features a fluorescent light source, which replicates actual daylight conditions in order to improve slide illumination. In addition to providing true colour testing, this feature will also provide the vision screener with 10,000 hours of extended service. 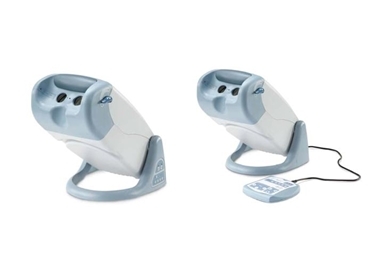 The Titmus V2 vision screener is easy to operate and features a manual wheel to advance test slides as well as a built-in membrane switch to occlude each eye and control peripheral vision tests. The Titmus V4 vision screener features an external membrane control panel. Located at the fingertips, the membrane control panel includes indicators for far/near, patient head position, eye occlusion as well as test slide position. The Titmus VSeries portable vision screeners can be used to screen the vision of adults and children in a variety of functions including occupational, professional, paediatric and at school.